Background: Mitigation of unwanted effects is a major issue to be addressed in drug discovery. The human genome shares a considerable degree of sequence identity and structural homology whereby multiple binding pockets of similar composition is seen across different family of proteins. This distribution of similar binding pockets in different proteins is a major reason for cross reactivity upon ligand binding. Therefore, identifying such off-targets on a case-to-case basis in the early stages of drug discovery pipeline is very much essential. Especially for developing specific ligands against isozymes such as glycogen phosphorylase it is a pre-requisite owing to its implications. The inhibitors of glycogen phosphorylase (GPi) control the blood glucose level effectively by inhibiting the hepatic GP (hGP). But due to its high degree of sequence identity with the muscle form (mGP) and similar binding pocket, these ligands cross react resulting in impaired muscle function due to prolonged relaxation. Therefore, molecular targeting or optimizing the lead to a specific target (hGP) is very essential. In the current work, a comparative docking approach was adopted wherein suitable ligands were designed based on the chemical descriptors present in lig18 binding site of mGP and hGP followed by virtual docking. Results: The docking results showed that lig18 optimized compound (lig18_7) had better affinity to hGP and mGP respectively. lig18_7 interacted with residues Arg171 and Asn172 that are present specifically in hGP indicating specificity. Using this improved comparative docking approach isoform- specific ligands can be effectively developed. Keywords: Comparative docking, Glycogen phosphorylase, Glycogen phosphorylase inhibitors, Pentacyclic triterpenes, Cross reactivity. Keywords:Comparative docking, Glycogen phosphorylase, Glycogen phosphorylase inhibitors, Pentacyclic triterpenes, Cross reactivity. Abstract:Background: Mitigation of unwanted effects is a major issue to be addressed in drug discovery. The human genome shares a considerable degree of sequence identity and structural homology whereby multiple binding pockets of similar composition is seen across different family of proteins. This distribution of similar binding pockets in different proteins is a major reason for cross reactivity upon ligand binding. Therefore, identifying such off-targets on a case-to-case basis in the early stages of drug discovery pipeline is very much essential. Especially for developing specific ligands against isozymes such as glycogen phosphorylase it is a pre-requisite owing to its implications. The inhibitors of glycogen phosphorylase (GPi) control the blood glucose level effectively by inhibiting the hepatic GP (hGP). But due to its high degree of sequence identity with the muscle form (mGP) and similar binding pocket, these ligands cross react resulting in impaired muscle function due to prolonged relaxation. Therefore, molecular targeting or optimizing the lead to a specific target (hGP) is very essential. 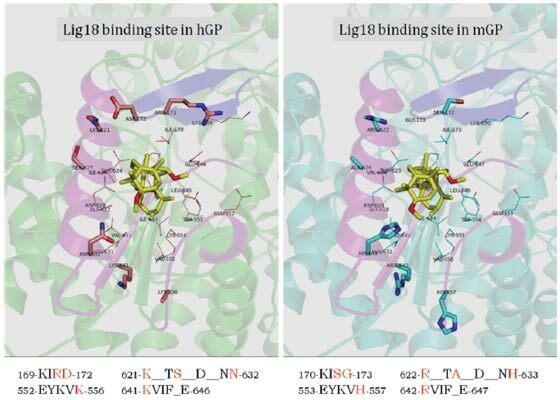 In the current work, a comparative docking approach was adopted wherein suitable ligands were designed based on the chemical descriptors present in lig18 binding site of mGP and hGP followed by virtual docking.